In her late thirties, journalist Jill Smolowe’s life and career at Time magazine was on track. Her husband, Joe, was still her most trusted confidante and best friend. And now that she and Joe had decided finally to have a child, Jill assumed the pregnancy that had come so easily to all the women in her family would be her own next chapter. But nature had a different script in mind. As her quest for a child swerved from the roller coaster of infertility procedures toward the baffling maze of adoption options, Jill’s desperation deepened — while Joe’s resistance to children only hardened. In the fog of depression, disappointments, and dead ends, their marriage began to founder. Then, halfway around the world, in Yangzhou, China, she encountered a future she’d never imagined might be hers. 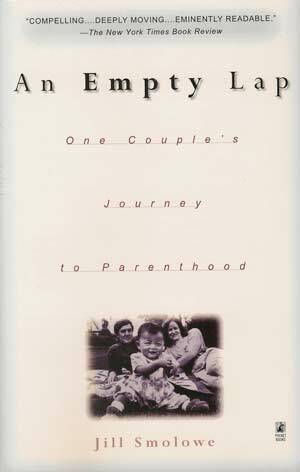 Honest and intimate, An Empty Lap is as much a window on a marriage as on a high-stakes baby chase. Compelling, beautifully told and as insightful as a novel, it’s filled with emotions that anyone who has yearned for a child will recognize.